Journalist Carole Cadwalladr has said she became a “news slave” for Cambridge Analytica whistleblower Christopher Wylie after tracking him down on Linkedin. 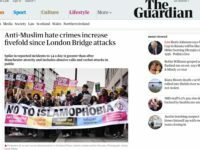 The resulting Observer scoop took more than a year to bring together, Cadwalladr told BBC Radio 4’s Media Show, and she said she felt “incredibly relieved” that the story is now out there and being well received. The investigation, which was first published in Sunday’s paper, exposed Cambridge Analytica’s alleged harvesting of the data of 50m Facebook users to influence the US presidential elections. 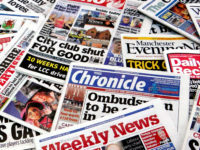 Cadwalladr said the Observer took the decision to share the scoop with Channel 4 News and the New York Times prior to publishing. She told the BBC that Facebook had made a “series of missteps” in responding to the revelations and said it had issued legal threats to deter publication. “Every single decision it seems to make at the moment is the wrong one, starting with trying to take legal action against us on Friday and shut the reporting down,” Cadwalladr said. The story began in February 2017 when Cadwalladr wrote about US hedge fund billionaire Robert Mercer, uncovering his financial links to the London-based data firm. Cadwalladr, who has already won prizes for her work on CA and Brexit, said: “I knew I hadn’t got it all,” as she told how she began trawling Linkedin contacting possible sources related to the company. After making contact with Wylie, they began speaking on the phone for two hours a day and she described him as “fascinating, funny and brilliant” person. She told the BBC that although she “accidentally stumbled” from being a freelance features writer into doing investigative reporting, the story came from chatting to people because “a story always comes from a person”. The first piece for which Wylie was a source was printed in the Observer Review last May, which was immediately pursued with legal letters despite what she said was a “very very forensic process” from editors and lawyers. 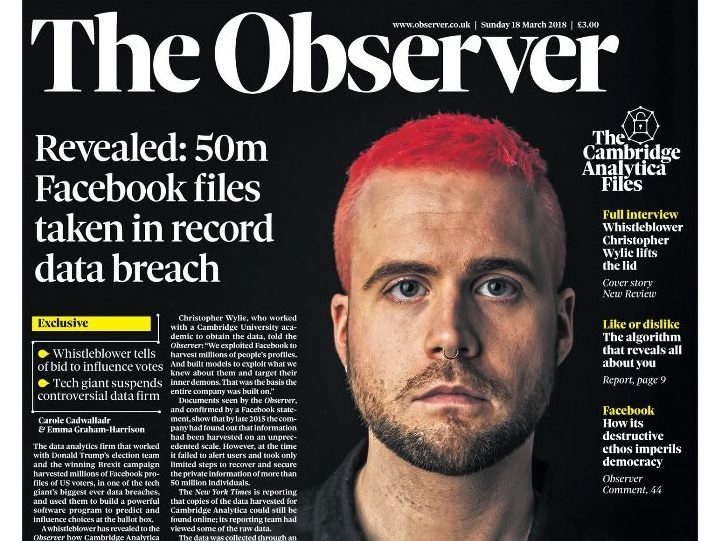 The Observer has now faced three legal threats from Cambridge Analytica and one from Facebook. During her investigation Cadwalladr began receiving abuse on Twitter, and said the biggest pushback she received on the story was from so-called “tech bros” – men who work in the male-dominated technology industry – because she is a middle-aged woman. Asked if she felt vindicated by the reaction to the story, Cadwalladr said: “I feel incredibly relieved. She added: “The tech bros really hated this story right from the start and I got a lot of pushback because I’m a woman and I’m middle aged and I’m really not very technical. “But of course it’s the political and it’s the human and it’s the social and it’s the philosophical bits of technology that interest me. Wylie insisted she should partner with a US news organisation so the story was also heard by an American audience. She joked that she became a “news slave” in the pursuit of collaboration with the New York Times. Channel 4 News also said it had received legal threats over its undercover reporting in which reporters met senior executives of Cambridge Analytica. Asked if they were working on the investigation themselves before the collaboration began, Cadwalladr said: “No, Channel 4 didn’t have anything until we hoved into view really. They’d started thinking about Cambridge Analytica in Kenya which is why they got in touch with me. Cadwalladr also revealed there is “lots more” to come in the story. She thought it was “remarkable” Facebook has tried to “put the blame on everybody else” since the story broke “when it’s been absolutely clear that it’s its own failures which are staring it hard in the face”. Since Trump’s election in 2016, Cadwalladr said, Facebook had “refused to acknowledge that there have been problems” and has now been forced into a corner by the latest reporting which contains “proof they can’t ignore”. Just hours after Cadwalladr was speaking yesterday, Facebook chief executive Mark Zuckerberg broke his days-long silence to apologise for past failures at the company. Zuckerberg wrote in a statement: “I started Facebook, and at the end of the day I’m responsible for what happens on our platform. I’m serious about doing what it takes to protect our community. “While this specific issue involving Cambridge Analytica should no longer happen with new apps today, that doesn’t change what happened in the past. He said Facebook had changed in 2014 to “dramatically limit the data apps could access” and that the company had received formal certification in 2015 that Cambridge Analytica had deleted all improperly acquired data. Cambridge Analytica has strongly denied the claims made in the Observer, the New York Times and Channel 4. It said in a statement said: “In 2014 we received Facebook data and derivatives of Facebook data from another company, GSR, that we engaged in good faith to legally supply data for research. The UK Information Commissioner is currently investigating the company. Labour, Leveson and Hacked Off want to change the law so that if Facebook and Cambridge Analytica sued the Observer, even if the Observer won, it’d still have to pay Facebook and Cambridge Analytica’s legal bills. Just let that sink in for a minute. Then ask yourself whether, under such an utterly stupid law, this story would ever have been published.